The Seriously Pro SPRacingF3 delivers all the features that you need from a flight controller, with the SP racing F3 flight controller at the heart of your airframe you can be a racer, an acrobatic flyer or an aerial photographer. The Seriously Pro is a perfect match for many flight disciplines. With support for a variety of aircraft, the SP racing F3 flight controller will be at home in tricopters, quadcopters, hexacopters, octocopters and more. The Seriously Pro Racing F3 builds on software which has been tried and tested. The processor and sensor technology on this small and powerful board will make your aircraft feel like its flying on rails. With the STM32F3 processor the Seriously Pro racing F3 manages 6DOF and efficient flight calculations, with more done in less time the controller can deliver a better and cleaner flight. 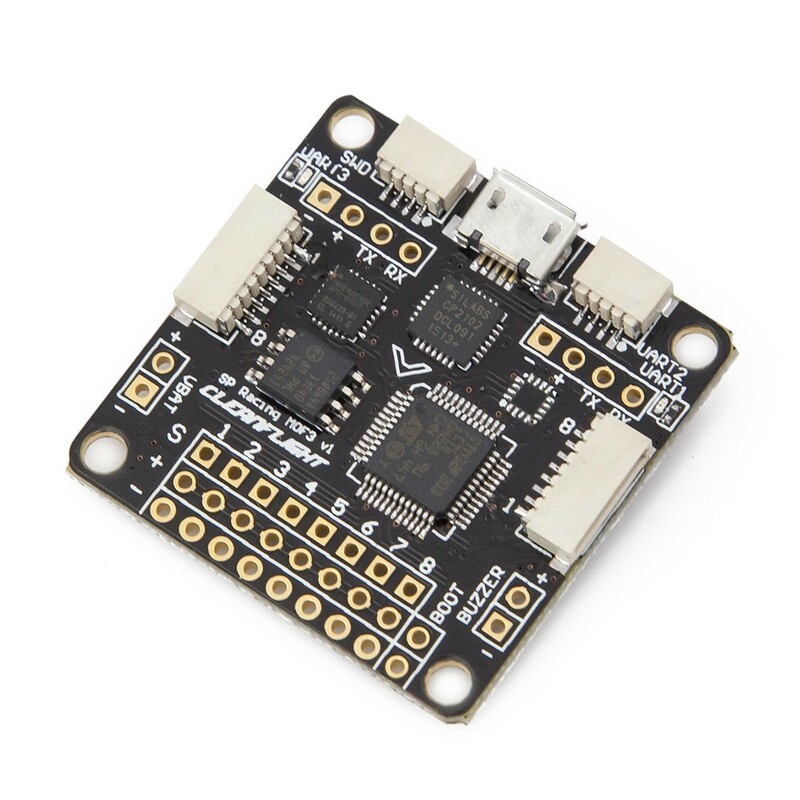 The open-source Cleanflight flight control (FC) software running on the Seriously Pro racing F3 flight controller has a growing community of users and friendly developers, which means that you are able to make changes and contribute to the code if you would like too. Being open source means that Cleanflight comes with a detailed manual that is reviewed and maintained by the Cleanflight developers and community. There is no more outdated wiki pages and second-hand information. Cleanflight can be configured to suit your needs using Windows / OSX / Linux on the cross platform GUI. The Seriously Pro SP racing pro F3 hardware has been designed by the developers of Cleanflight to be a very capable flight controller. Download the SPRacingF3 Manual here. Practical - Easy to access connectors and solder pads. Configurable - Choose to use connectors, solder pads or pins. Stackable - Mount to your PDB or OSD. Professional - Symmetrical, Neat and Tidy.